Supplies needed for sowing Hosta seeds and how to plant them. Growing Hostas from seed is much like growing other perennials and annuals from seed. If you are an experienced seed grower, you will have no trouble raising Hosta seedlings. Much of the following information is basic seed growing know-how, but you will find a few tricks of the Hosta hybridizing trade scattered throughout. Hosta seeds can be planted in just about anything. For a small scale hybridizing venture, fast food containers work great. 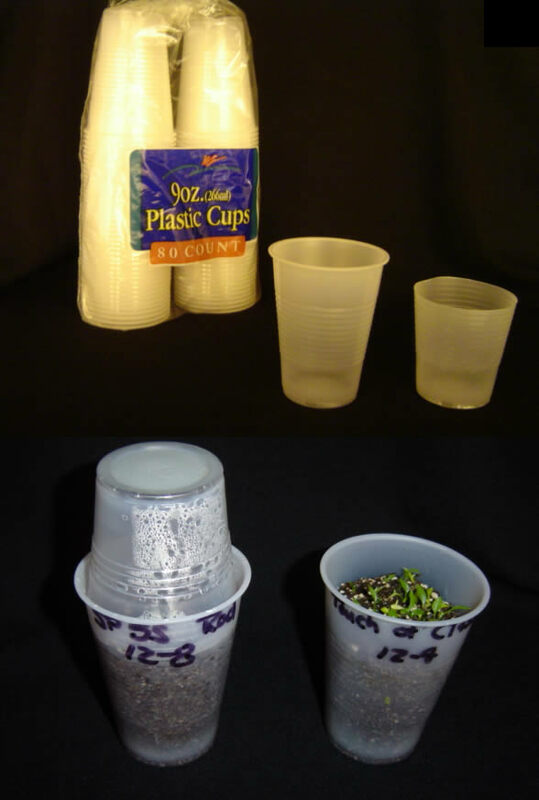 The plastic, closeable containers make perfect miniature greenhouses and come in a range of shapes and sizes to accommodate varying amounts of seed. Jeff White, of Waterloo, Iowa, uses two plastic cups to create micro greenhouses. The base of the greenhouse is one cup with a few drainage holes punched into the bottom edge. The top 1/3 of the second cup is cut off. It is then inverted and fits down into the first cup, completing the enclosure. Other hybridizers find traditional plant containers more convenient. Large amounts of seed can be sown directly into a standard flat. A flat can also be divided into sections using sticks, sections of Venetian blinds, or other common objects and planted with several types of seed. Still others prefer to use appropriately sized pots. A standard 1020 flat can hold about 16 - 4 inch pots, each holding a different cross. There are as many different planting media as there are Hosta hybridizers - maybe more! Most can be used to grow Hostas. The trick is adjusting your cultural practices to accommodate the properties of the medium. Most mixes are peat based. Peat absorbs and holds a lot of water, which is essential for germinating seeds. The Hosta seeds need to be constantly moist from the time they are planted, until they have several leaves. At that stage, the seedlings are more tolerant of short periods of dryness. Hostas also need air around their root system. That is the purpose of other components in planting mixes like perlite, bark, grit, and sand. A mix that holds moisture, yet is free draining and loose, is ideal for Hostas. Some adventurous hybridizers enjoy mixing their own potting mix, often adding exotic ingredients like Green Sand, bat guano, and coir. It is usually easier, less expensive, and just as good to use a commercial potting mix. Some mixes are especially fine textured and intended specifically for starting seeds. Seed starting mixes hold a lot of moisture and the fine texture ensures good contact between moist mix and seed. Special mixes are not necessary, though, and a good quality, general purpose potting mix will work just as well. What you never want to use to start seeds is top soil, soil from your garden, or compost. These are much too heavy to use as a seed starting media or for growing small seedlings. More importantly, these are infested with bacteria, fungi, weed seeds, and insects. These organisms are kept in check outdoors, but will wreak havoc on your Hosta seedlings indoors. Newly sprouted seeds and young seedlings are highly susceptible to fungi, bacteria, and insects. The warm, moist environment needed for germination is also ideal for the growth of these pests. Therefore, it is important to make sure all pots, flats, domes, and even the potting media are as close to sterile as possible. Pots, flats, and other supplies can be disinfected prior to use by rinsing in a 10 percent bleach/water solution. This is especially important if you are recycling used pots and flats. 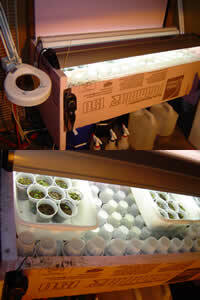 Potting mix should be heated to kill diseases and insects, even if it is supposed to be sterile already. Slightly moistened mix can be baked in the oven at 200 degrees Fahrenheit for at least an hour. Smaller batches can be microwaved for 10 minutes. Previously used potting mix should ever be re-used with seeds or small seedlings. To prepare to sow your seeds, fill the sterilized planting container with planting media. Moisten the mix until it is thoroughly moist to the touch. The media should not be soggy. Next scatter the seed evenly over the surface of the moist mix. A single container can hold a lot of seeds. The seedlings will only be in the initial container for six to eight weeks, so they can tolerate being shoulder to shoulder. At this point, you have a decision to make - to cover or not to cover the seeds with potting mix. Some hybridizers just press the seeds firmly onto the media to ensure good contact and leave it at that. The disadvantage is that a few seedlings will have trouble getting their first root into the potting mix. A little gentle help with a sharp pencil tip will help wayward roots get growing in the right direction. Hosta seeds do not need light to germinate, so covering them is also acceptable. 1/4 inch or less of mix over the seed will keep the tiny new roots where they belong. Covering also helps to keep the seed from accidentally drying out. 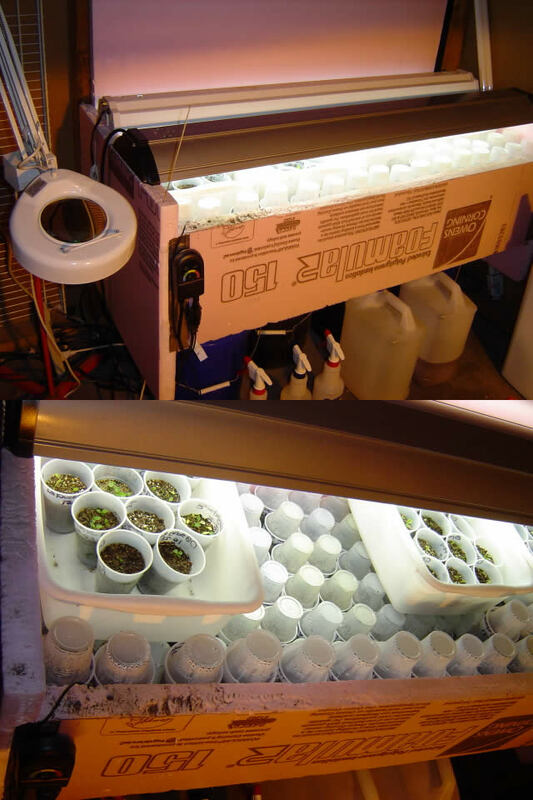 Germination chamber constructed of rigid polystyrene insulation sheets with a heat mat in the bottom. Drying out is the kiss of death for germinating seeds and young seedlings. For the next six to eight weeks, it is vital to keep the potting mix constantly moist. Until the first leaves appear, it is best to keep the seeds covered to maintain adequate moisture. Clear domes can be used to cover entire flats or an entire flat can be slipped into a large plastic bag. After the first leaf appears, you can begin to gradually remove the cover for longer periods of time every day. Some hybridizers find that leaving the domes over Hosta seedlings causes no problems and reduces the need to water frequently. A few people even switch to taller domes as the seedlings grow. Aside from moisture, the other requirement for seed germination is heat. Supplying extra heat is usually not necessary in the average home. If your seed growing area maintains a constant temperature of at least 65 degrees Fahrenheit, your Hosta seeds will germinate fine. Warmer temperatures will speed up germination, though. Some hybridizers set their seed flats on warm appliances like televisions and refrigerators for a little extra heat. Others like to use special heat mats. Typically, Hosta seed germinates in 7 to 14 days. This is mainly dependent on temperature. Germination has been reported in as little as two to four days with potting mix temperatures in the 80 degree range. Genetics also apparently play a role and seed from Hosta 'Dorothy Benedict' is said to take three weeks or more to germinate.